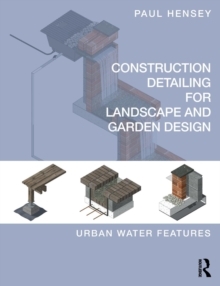 Following on from the author's previous book Construction Detailing for Landscape and Garden Design: Surfaces, Steps and Margins, this book Construction Detailing for Landscape and Garden Design: Urban Water Features, provides clear instruction for the construction of small to medium scale water features. With over 130 black and white CAD designs, Hensey provides guidance on a range of different water features such as drainage, water bowls and containers, walls and edges, structures and crossings, and rills, channels and cascades. This book offers technical references and a general knowledge of the basic principles, materials and techniques needed when engineering with water. This practical guide would be beneficial for garden designers and landscape architects seeking accessible and relatable materials for designing water features.